The New York Jets were hoping to maintain their position atop the American Football League’s Eastern Division as they hosted the Denver Broncos on December 3, 1967. Steadily built up over five seasons under the direction of Head Coach Weeb Ewbank, the Jets had a potent passing game led by QB Joe Namath throwing to an outstanding group of receivers, although the running game was hindered by an injury to HB Emerson Boozer. The pass defense was suspect, but the Jets had a 7-2-1 record and looked poised to win their first division title. Denver was once again in rebuilding mode, this time under Head Coach Lou Saban, who had previously achieved success in Buffalo. There were 18 rookies on the roster, including HB Floyd Little (pictured above), the prize first round draft choice out of Syracuse. 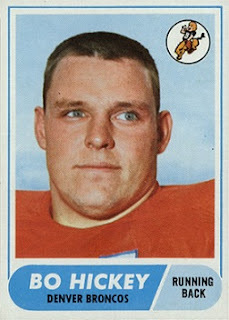 Al Denson, shifted from tight end to flanker, was having a fine season but QB Steve Tensi, who came to the club from the Chargers with great expectations, had not been impressive and now his status was uncertain due to a back injury. The Broncos had a 2-10 record and hardly seemed a threat to New York. It was a rainy day at Shea Stadium with 32,903 fans in attendance. The field was muddy and the teams slogged through a scoreless opening period, but the game broke open in the second quarter. First, FS Jack Lentz of the Broncos intercepted a Joe Namath pass, returning it 25 yards. The result was a 43-yard Bob Humphreys field goal. Two plays after the ensuing kickoff, Lentz again picked off a throw by Namath and returned it 47 yards to the New York three. From there, FB Bo Hickey ran for a touchdown. Humphreys was wide on the extra point attempt but, in rapid fashion, the visitors were ahead by 9-0. It got worse for the Jets shortly thereafter when, forced to punt, Floyd Little returned the kick 72 yards, charging straight down the middle of the field for another Denver TD. With Humphreys successfully converting this time, the Denver lead was extended to 16-0. Once again Namath went to the air with a long pass and once more he was intercepted, this time by CB Goldie Sellers, who ran it back 47 yards to the New York 30. Steve Tensi threw to split end Neal Sweeney for 15 yards and flanker Al Denson for a 10-yard touchdown. Humphreys once again added the point after. On the next series, it was LB John Huard picking off another Namath pass, and Denver again took advantage when Humphreys booted a 47-yard field goal. With QB Mike Taliaferro in for Namath, the Jets were finally on the move with time running down in the first half. But on the last play, his pass was intercepted by LB Frank Richter at the goal line. It was the fifth Denver interception of the period, and the teams headed into the locker room with the visitors holding an astonishing 26-0 lead. Namath was back behind center in the third quarter, and following a poor punt by the Broncos, the Jets finally got on the board when Jim Turner connected for a 39-yard field goal. However, the Broncos got a break on another miscue by the home team when DB Bill Baird fumbled a punt that was recovered by Denver center Larry Kaminski at the New York 12. Two plays later, HB Wendell Hayes ran five yards for a TD and Humphreys booted the extra point to make it a 33-3 game. New York furiously fought back, and a drive was kept going following a roughing-the-kicker penalty. Namath completed passes to TE Pete Lammons for 11 yards, split end George Sauer for 27, and Lammons once again for an 18-yard touchdown. Turner tacked on the extra point and the score stood at 33-10 after three quarters. The Jets continued to try and mount a comeback in the fourth quarter, scoring on two touchdown passes by Namath. He first connected with FB Mark Smolinski for an 18-yard TD, although a pass for a two-point conversion was unsuccessful. The second came when Namath fired a pass to HB Bill Mathis in the end zone and this time the Jets were able to add two points as Mathis took a pitchout and ran across the goal line. But it was all a case of too-little, too-late for the Jets. Denver held on to pull off the upset by a final score of 33-24. New York dominated in total yards (345 to 142) and first downs (23 to 9). But the six turnovers proved devastating for the Jets, and while the Broncos didn’t generate much offense, they also didn’t turn the ball over. Denver was also penalized 9 times at a cost of 121 yards, to four flags thrown on the Jets. Steve Tensi completed just 7 of 16 passes for 59 yards and a touchdown, although with none intercepted. Bo Hickey topped the Denver runners with 48 yards on 16 carries that included a TD while Wendell Hayes picked up 43 yards on 18 attempts, also with a score. Floyd Little, whose sensational punt return was a significant part of the second quarter surge, suffered a broken collarbone and thus ran the ball only four times for 15 yards. Al Denson topped the receivers with two catches for 42 yards and a touchdown. For the Jets, Joe Namath was successful on 24 of 60 throws for 292 yards and three TDs, but also gave up four interceptions. Pete Lammons (pictured at left) caught 9 passes for 106 yards and a touchdown and George Sauer added 5 pass receptions for 83 yards. 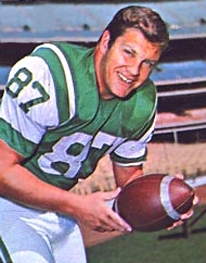 Bill Mathis was the club’s top rusher with only 21 yards on five attempts although he contributed three catches for 54 yards and a score. “You just can’t give away the ball six times and still win,” summed up New York’s Weeb Ewbank. The loss dropped the Jets into a tie for first in the Eastern Division with Houston at 7-3-1 and they lost their next two games before winning the season finale, which caused them to end up a disappointing second with an 8-5-1 record. Denver finished at the bottom of the Western Division with a 3-11 tally. 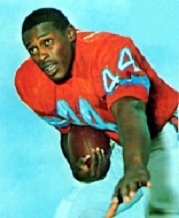 Floyd Little had the distinction of scoring the only touchdown on a punt return in the AFL in 1967. While his rushing numbers were modest, with 381 yards on 130 carries (2.9 avg. ), he led the league with a 16.9 average on 16 punt returns and also averaged 26.9 yards on 35 kickoff returns on the way to topping the circuit with 1626 all-purpose yards.